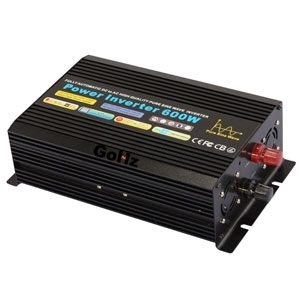 600 watt pure sine wave power inverter to convert 12v DC battery to 110v/220v AC to charge your home appliances. Tips: What is continuous & peak output power of a pure sine wave inverter? Some home appliances, such as refrigerators, washing machines, drills, etc., require big instantaneous starting current during startup, but only need a small current to maintain its normal operation after started successfully. Therefore, there is the concept of continuous output power and peak power output for the sine wave inverter. Continuous output power is the rated output power, generally the peak output power is 2 times its rated output power, i.e a 600w pure sine wave inverter peak output is 1200w. Must emphasize, some household appliances, such as air conditioners, refrigerators etc. the starting current is equivalent to 3-7 times of the normal operating current. Therefore, we need to make sure the starting power of such home appliances is lower than the inverter's peak power to make the inverter & household appliances work properly.